And this has been my mission for the past year or so. I tried and loved Deb’s recipe, but still preferred something I could make ahead. 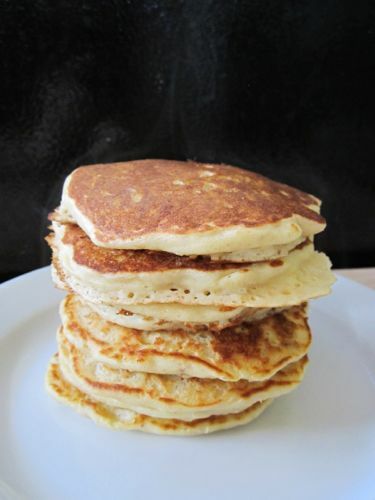 I lingered for a few months on Heidi’s pancakes from Super Natural Everyday — a worthy contender, and I love her inclusion of barley flour — but I wasn’t always crazy about how the pancakes came out when I made the batter the night before. I tried a few more that weren’t even worth mentioning here, and was getting discouraged. Then, my dear husband gave me King Arthur Flour Whole Grain Baking for my birthday, and let me tell you — I hit the pancake JACKPOT. One of the first recipes in the book is for this Homemade Whole Grain Pancake Mix, and it has been the answer to my pancake prayers! Designed to make ahead, a mix of whole wheat and oats, not too sweet, and ready to eat in about 15 minutes. Brilliant. 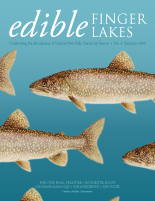 Over the months, I’ve fine-tuned it to what we usually have in our pantry and fridge (i.e. yogurt instead of buttermilk, quick-cooking oats instead of pulsing whole rolled oats — which, I know, doesn’t take long but I’m often in maximum efficiency mode these days.) I mix up a big batch — 10 cups worth — of the mix and store it in the freezer. When we’re ready for pancakes, I take out a cup of mix and stir it together with an egg, milk and yogurt (Miss A usually helps me with that part.) While the pancakes cook, I make my coffee. It’s now a routine. 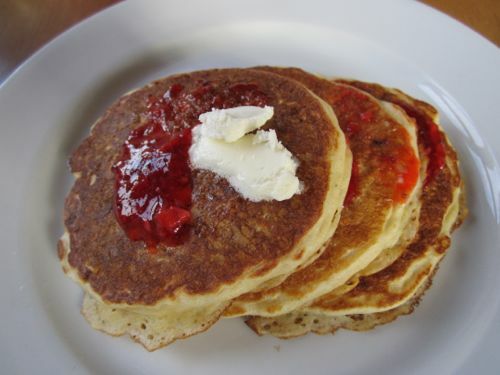 We love these pancakes with a little butter and some good maple syrup (Miss A and B’s preference) or strawberry freezer jam that I made last summer (my favorite.) I sometimes add chopped up fruit to the batter, or a handful of grated vegetables to make savory pancakes for lunch or dinner. I even gave the mix as gifts to friends and family for Christmas — yes, I am proselytizing this recipe! These pancakes have become a Friday morning routine in our house, and I hope you, dear readers, will love them as much as we do! 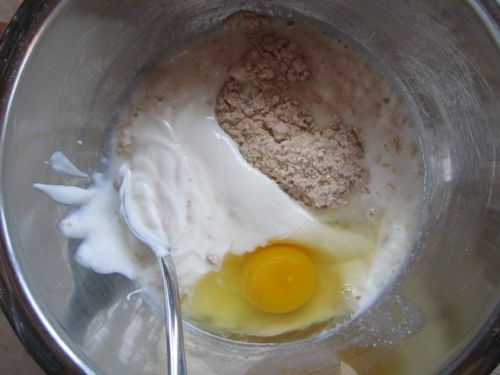 Stir the pancake mix together with the milk, yogurt and egg. 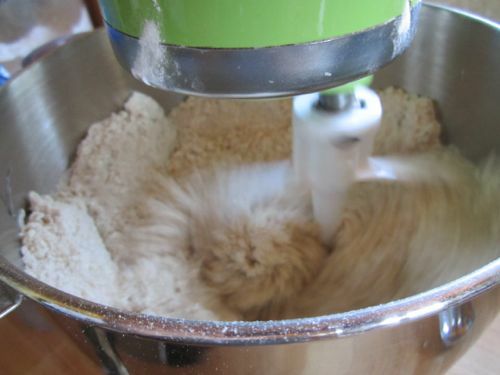 [Amy’s note: King Arthur Flour recommends you let the mix sit for 20 minutes so that grains can soak up all the liquid before cooking the pancakes; I usually only do 10 minutes and they’re great.] 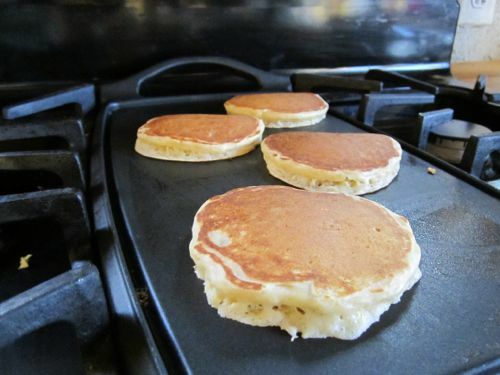 Spoon the batter in 1/4-cupfuls onto your greased griddle or pan; when the edges look dry and bubbles begin to appear on the surface, flip the pancakes and cook another 2 minutes or so. Serve warm. I definitely need to try this – those pancakes look delicious! Not only do the pancakes sound delicious, I love how you can mix it up before hand, and have pancakes ready to go even on a weekday morning. Plus I’m a fan of adding shredded veggies for savoury pancakes – how have I never thought of this before? Topped with some sauteed mushrooms and cheese…I’m drooling! Yes – we love a quick lunch of pancakes w/some shredded carrots/zucchini added! Those sound very good and healthy too. This is off the subject of pancakes but wondering if you’ve ever tried a carrot cake with bananas..I just mashed a soft banana and then added a piece of Whole Food’s carrot cake on top of it, and the combo tasted very good.. I plan to make those pancakes sometime soon! I haven’t, ger, but the banana sounds like a nice addition to carrot cake – nice and moist. I tried these last night and they came our much less fluffy than the way yours look in the picture. How thick was the batter before you put it in the pan? I’m wondering if, perhaps, my yogurt was thinner than yours or maybe I chopped up the oatmeal to finely. Any thoughts? Thanks! Since I did my undergrad at Cornell, I have even more of an affinity for your blog because it makes me think of my beloved Ithaca!! Hooray! I can imagine that it’s wonderful to raise a family there. I’m class of ’94. 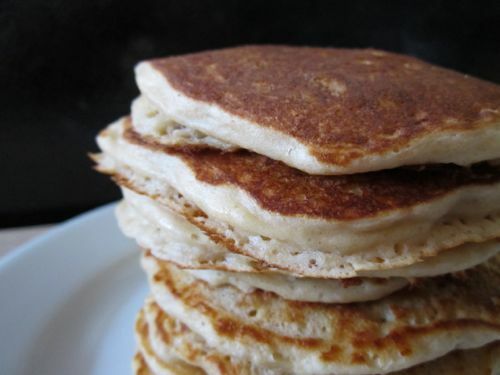 What a great idea – Pancakes in the freezer and good for you too! Love it. I’m always looking for easy breakfast ideas that are healthy too. I love the notion of making your own mix. You could even add powdered milk to make it even easier, which I might actually do because rarely have fresh milk on hand. My four year old ate five of these in one sitting he thought they were so good… and he’s somewhat of a pancake connoisseur :-). Oh ya- I used my vitamix for the dry mix since I don’t have a kitchen mixer and it worked well to combine oil and grind oats at same time (process was a little involved, though). I realize this is far after your publish date, but thought I’d let you know that I made the mix this morning and immediately used it to make pancakes that my kids and I inhaled. Thanks for a great recipe!